Forza Horizon 2 accueille aujourd'hui le DLC du mois de Mars comprenant six bolides histoire de faire grossir encore un peu plus votre garage du Festival Horizon. Sans plus attendre, foncez télécharger le Rockstar Energy Car Pack et prenez la route avec vos nouvelles voitures ! 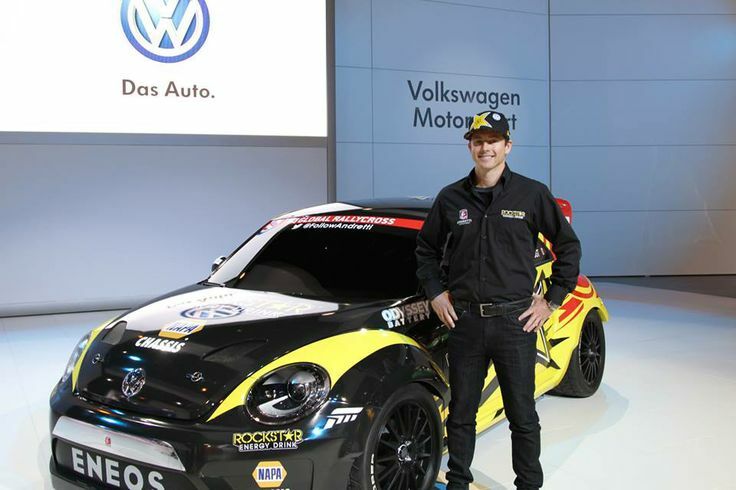 Where can you drive Tanner Foust’s Global Rallycross Beetle? In Forza Horizon 2 for Xbox One with today’s release of the Rockstar Energy Car Pack! Built for the dirt-filled circuits of the Red Bull Global Rallycross series, this 2014 Volkswagen GRC is an ideal mixture of pure power and serious grip. This, just a week or so off its Fast and Furious stand-alone content unveiling. Tanner’s Beetle is just the start with the Rockstar Energy Pack, which also includes an array of cars that are just waiting for their chance to kick up a cloud of dust. In the woods or on the road, the newest Subaru WRX STi is ready for action; for luxury cruising there is no match for the ultimate “Ultimate Driving Machine,” the BMW 850CSI. The latest super saloon from Jaguar is waiting for you to sink into its lap of luxury and, lo and behold, we have another Forza first: the Desert Dingo #1107 Baja Bug. Your free car for March is the Acura Integra Type-R, a high-revving, front-wheel-drive beauty. Volkswagen says it’s way hotter than “Herbie,” and we would be hard-pressed to argue. 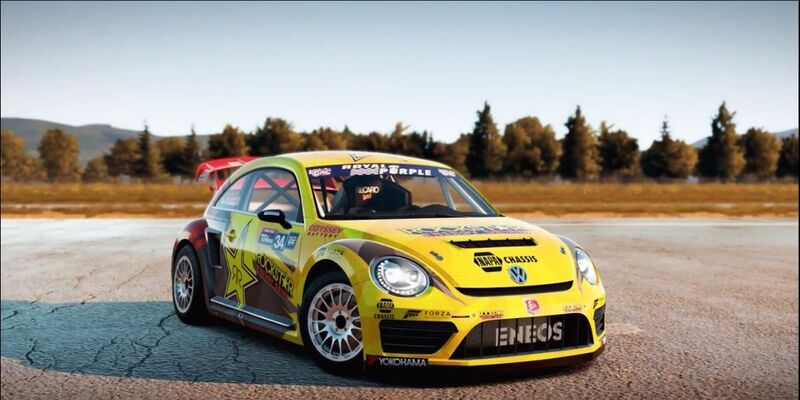 Tanner Foust’s Red Bull Global Rallycross Beetle has been built from the ground up as a thoroughbred racecar. Foust, who was sponsored by Xbox and Forza during the 2014 GRC season, debuted the Beetle GRC at the Los Angeles leg of the 2014 Global Rallycross season and drove it the rest of the year to develop it to compete in 2015. With 540 turbocharged horsepower coming from the 1.6-liter motor and all-wheel-drive to get things moving, this is a Beetle like no other. In a straight line, this Beetle will see 0-60 in just over two seconds. In the corners, it drifts and cuts a turn with precision on any surface. It’s a Forza first, and Forza Horizon 2 is the perfect environment to give it a good thrashing. The WRX is a car for all occasions. You can drive it daily, you can take it road racing and it launches like a rocketship at the dragstrip. And rallying? It’s what it the WRX was designed for. Out of the box, the STi is fast and has intuitive, incredible handling. It also takes to modification wonderfully and can quickly become a go-to car for just about any event. The heart of the 2015 WRX STi is still the faithful EJ motor. The sound it makes, the way it the turbo spools up and sets you back in your seat, and the steady stream of power are proof enough there is no reason to fix what isn’t broken. Sure, the WRX STi is all boy-racer, but if you are going to talk the talk, it’s cool to walk the walk. The closest thing to an M8 BMW ever developed will not only drop your jaw at almost any speed, it will do so with the style and refinement that only a BMW provides. In its day, this was BMW’s ultimate driving machine. It came with a 5.6-liter V12, included sleek reshaped bumpers and an improved suspension with newly-developed technological electronic enhancements such as stability control. The car’s V12 doled out more than 400 foot-pounds of torque and 372 hp. While some may argue the car was too luxurious and carried to much weight as a result, the pillarless hardtop design is stunning. And, really, is there really any such thing as “too luxurious?” We think not. The notion of the four-door sports sedan just got a shot in the arm in the form of the Jaguar XFR-S. No matter what company you keep, this feline is dressed to impress and courtesy of a 550-horsepower V8, ready to pounce on command. Those are supercharged horses under the hood, so there is the added benefit of the lovely whine of the machinery. If you don’t feel like smoking the tires all day, which this Jag can surely do, there is an active differential system that modulates power to the wheels to maximize grip. Jaguar is the originator of the super saloon, and in the modern era of supercar luxury models, they continue to show the automotive world who the top dog… or cat… is. Desert Dingo Racing is one of the few teams crazy enough to try and take on the legendary Baja 1000 off-road race in a class eleven Volkswagen Beetle. Class eleven means stock so, plainly put, the Dingos race a stock air-cooled VW bug in the longest continuous off-road race in the world. No, it’s not easy; in fact, it is near impossible, despite the VW Bug’s legendary durability, adaptability, and gumption. We are talking about silt beds that will swallow a Beetle whole, rocks that are bigger than the wheels, and hidden jumps placed on the course by locals who watch in excitement as unwary racers catch huge air. The terrain of the Baja 1000 is well suited to 1,000 horsepower trophy trucks with two-feet of suspension travel. For a stock Beetle, that is already more than 40 years old, it’s sheer torture on both man and machine. The Dingo’s have yet to win the race, in fact they have yet to finish, but the #1107 is ready to show you what it’s got and win your heart. This month’s free car for Forza Horizon 2 for Xbox One is a JDM gem that is anxiously awaiting to be tuned and cruised. The Type-R name has become legendary for a good reason: there have been few front-wheel drive cars so rewarding to drive as the Acura Integra Type-R. Then there’s the sound of the highly-developed 1.8-liter four — when the VTEC kicks in on the motor’s way up to a stratospheric 8,600 RPM redline, it’s clear this coupe means business. A whole generation of car enthusiasts grew up with the Integra Type-R being their ideal sports coupe — a blank slate for modification already pretty hot right out of the box. Hot, but subtle — you might miss the taller rear wing and model-specific lightweight wheels if you’re not looking for them. Of course, there’s nothing subtle about its performance, and there are few brand-new front-drivers that can keep up when the going gets twisty. The Rockstar Energy Car Pack for Forza Horizon 2 on Xbox One is now available for $5. Après les indices traditionnels précédent la sortie, le Rockstar Energy Car Pack vient de débarquer dans Forza Horizon 2. Le sixième pack mensuel est en effet disponible depuis quelques minutes dans les menus du titre de Playground Games et propose six nouveaux bolides à placer au plus vite dans votre garage. Pour le plaisir des yeux, et pour découvrir ce qui vous attend avant de craquer pour ce DLC, voici comme à l'accoutumée la vidéo de présentation mis en ligne par le développeur. 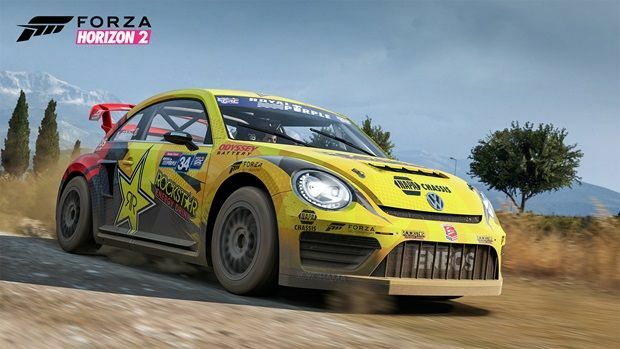 Attention les yeux car pour ce nouveau DLC un pilote est à l'honneur "Tanner Foust". Pour profiter des six voitures du Rockstar Energy Car Pack, il vous suffit de lancer Forza Horizon 2. Le pack de véhicules vous sera proposé en téléchargement pour 5 euros via l'onglet « Marché ». Evidemment, les possesseurs du Car Pack peuvent profiter gratuitement de ce sixième DLC (le dernier gratuit avec le Car Pass) mensuel. Notez également qu'il est désormais possible de placer dans votre garage toutes les autos des packs que vous avez téléchargés sans dépenser ni crédits ni jetons, et que, ce mois-ci, c'est la Acura Integra Type-R qui s'offre en échantillon gratuit. Bon jeu !